The mighty oak that is Phil Vincent has been an appropriately solid presence on the melodic rock scene over the past 16 years, churning out no less than 26 albums, 14 of which have been solo efforts. Although he doesn’t tend to make jaws drop, his releases have never been less than entertaining, so I was happy to see this new double CD, even if the cover made me want to run and hide. The reason that the new album “Face It” comes packaged with “Solar Flare” is that the latter was released last year as a digital only purchase. This, therefore, is Phil’s gift to fans of a physical copy at no extra cost. As usual. PV has done almost everything here, from playing to singing to producing, and I have to say he’s done a bang up job. The sound is clear, with clean vocals and some truly stomping guitar riffs. “Is This All There Is?” for example, thunders along like a freight train, and overall it’s an album that lives or dies by the sheer power contained in the riffs. I may not have heard all of Phil’s albums, but I’ve heard most, and I have to say that “Face It” shows a remarkable staying power, the end result being one of his best. His vocals sound great, his guitar is intricate, the songs are hard hitting as well as melodic, and whilst he still doesn’t give me that “wow” factor I am very happy to listen to this for the foreseeable future. Inside the double pack you get an excellent shot of Phil’s “gurning” face, but hiding behind that is the bonus album “Solar Flare”. It’s a twelve track full album, and in all honesty stand up very well to “Face It”, although the production feels a bit rougher where vocals are concerned. Nonetheless, it’s another solid offering that will be thoroughly enjoyed by existing fans. 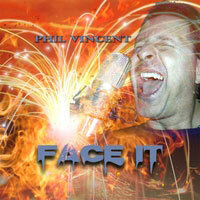 Available from Phil’s website or CD Baby, I heartily recommend this bargain double pack of hard, melodic rock. 'Hunger' is the fourth studio album for Melodic Hard Rockers Tragik. Who are Tragik? Well I’ll tell you. They are Phil Vincent, Damian D’Ercole and Dirk Phillips, with guest appearances on the guitar front from Vince O’Regan, David Zychek and William Roux. The album is straight up Hard Rock, built on a solid foundation of big riffs and towering drum a pumping bass line, with the icing on the cake being Vincent’s unmistakable vocals. The album gets underway with ‘Giving Up’, a trailblazing opener that sets the bar for the rest of the album. There is a maturity about this particular release, I think all parties have gelled well together on this album and this shown by the variety of the album. This is felt with the second track ‘Don’t Say A Word’, as this one starts off with a little electro keyboards, you think you're in for a touch of 80’s pop rock, but then the track soon blows away that thought as the big licks come in courtesy of Mr O’Regan. There’s a touch of old school with the storming ‘Look At Yourself’, before the 12 minute plus splendour of ‘Eye In The Sky’, a three part melodic roller coaster that will take you on the ride of your life, so much so, you’ll want another ticket to do it all over again. This opus has more layers and elements than I can find superlatives for. This is Melodic Rock at its modern best. It's back to that 80’s felt Hard Rock with heavily influenced keyboard moments with ‘I Will Remember’, then it's time for a little unplugged moment with the excellent ‘For You’, before rocking things back up big style with ‘No Tomorrow’. Now it's time for Tragik to unleash the big bass lines and delve on the heavier path with one of my favourite tracks off the album ‘This Is How It Has To Be’, a real meat and bones rocker. Sadly all good things must come to an end and the album closes off with a touch of the epic, with the haunting acoustic tones of the almost Beatlesque ‘Til The End Of Time’. This is without a doubt the best Tragik album to date and shows how not only the band have developed, but it also shows that you can still be true to your roots but put enough modern spin on things to take this genre forward. Come on, let's not only feel the 'Hunger' but let's taste it live!